It's not surprising. There are so many unis, courses, on-the-job training options and more. Nobody likes too much choice, least of all when you go to a restaurant and the menu is as long as Father Christmas' naughty list. Worry not - we're here to help you find your way. No idea? no problem. what are your choices? If you're going to be turning 16 or 18 soon you might feel a bit overwhelmed with what your next stage is going to be. If you are, don't panic. You still have plenty of time to decide what's right for you. In these videos our chief presenter Moj Taylor gives you a few ideas that might help you work out what the best option for you is next. Push's blog gives you all the help you'll need when you've not got a clue what you want to do. Check out the featured blog posts below which go through ideas on what to fill your time with post-18, and tips on changing your way of thinking about the future. Push guest speaker Ben - who took a different route to getting a degree (via his job) gives advice on the choice to make at 18 if you feel you've no idea. Professional actor & Push presenter Stephen Bradley expresses what he wished he'd known when he was finishing school. He highlights how he felt anxiety as a teenager, and how to combat this. 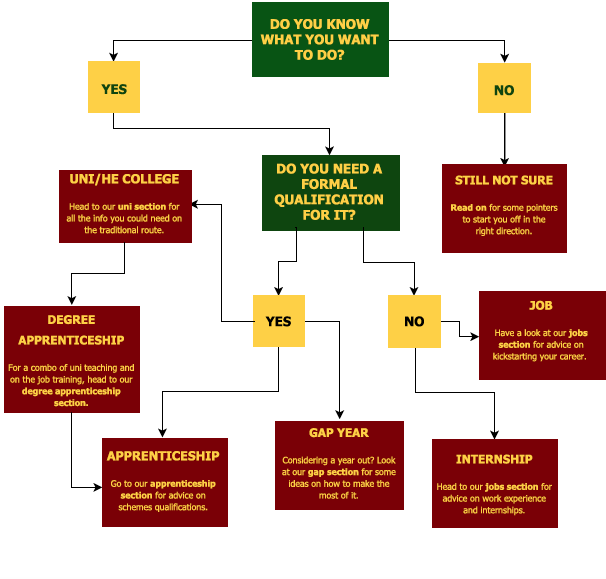 So, you've landed on this page, probably feeling confused or anxious (or just a little resentful) that your mates to one side are all dreaming of a degree, and your mates on the other side are waxing lyrical about the benefits of an apprenticeship. You're in the middle, but you're no piggy. Listen up closely: it's absolutely fine to have zero idea about what you want to do with your life, whether you staring at these words as a 16 year old or a 46 year old. ​Most of the panic about choosing what you might do after school comes from the feeling that you're meant to have the next 30 years of your life planned out and mapped by the time you blow out those 18 candles, and that everyone else has had it planned out in their heads since they were 10. ​They haven't, and even if people are dead set on university or an apprenticeship route, that doesn't mean they necessarily know what they want to do beyond that. ​So maybe you’re feeling that university isn’t the path for you right now. That’s completely fine; not everyone wants to (or is even suited to) university life straight after school. People go to university in their 20s or 30s (or even in their 80s). Just because you don't go now, it doesn't mean you can't ever. What’s great is that there’s so many alternatives to uni (more than ever before) available to you now. Those who follow what they're truly passionate about (a favourite subject, a hobby, a skill, or just something they're really curious about getting really good at. This might be because it looks fun and holds their attention, because an experience related to the thing has affected them profoundly in life, or they admire someone famous or well-known who seems really happy dedicating their life to it. Those who are brave enough to just leap into the unknown and go with their instincts over what feels like the right thing to do right now in life. That might mean you stay at home for a bit and earn some money while researching. Or you leap into an apprenticeship or alternative training scheme with a local employer. Or you leap into a degree in something that sounds weird and fun. Or you leap into a volunteering programme in Africa or South America, then see how your experiences have made you feel after a year away. No idea what to do next? Aron gives you some words of advice. The only thing to not do is do nothing. Don't be a sloth (even though they look chilled). Sloths can worry about being a sloth, that's their job. You're not here in life to imitate them. The average UK human only gets around 700,000 hours alive, so why on earth would you not want to throw yourself into things? Some things will work, a lot of things won't, but you learn just as much about what you might want from life by experiencing a little of what you definitely wouldn't want. Jump headfirst into education, training or experience, or a combination of all three each day. Doing nothing doesn't help your family, your relationships or (most importantly) you and your dreams, nor does it help your mental and physical wellbeing.